Aren’t you tired? I know I am. The High Holy Days must have worn me out, not to mention everything that the new “school year” brings. You don’t have to be currently enrolled to know what I mean — I tend to think that summers in Minnesota can’t get any busier, and then we up the ante every September, getting to all those things we (thought we) didn’t have time to get to June through August. And that’s when the avalanche begins. I don’t know if I’ve had a legitimate evening off since August. Crazy, isn’t it? So what have I been eating? 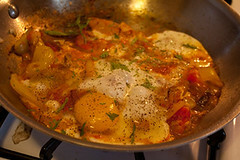 Shakshuka, basically.